Stay Prepared! Keep the Charge and Gas Up! A blog post, “It Took an Earthquake to Teach Me Preparedness and Priorities” from The Idea Bucket, regarding the recent earthquake in Nepal, brought something to mind. Namely, the things we often overlook when planning for an emergency. Two of these are: Keeping your cell phones adequately charged up, and keeping an adequate amount of gas in your car. I usually charge my phone if the battery level falls below 80 percent by day’s end, barring unusual circumstances, and when I travel; I always bring my chargers with me. And, I have a car charger for the phone, as well as one for my home. And this is a good idea, because you never know when you may need to use your cell phone at an unusual time. See Lesson 4 in “It Took an Earthquake to Teach Me Preparedness and Priorities” from The Idea Bucket. I also keep my other electronics charged up as well, even though they are less likely to be needed in an emergency, possibly. If they are, I know I’m prepared. And the car? Yes, I have read once or twice in the past that one should keep at least a quarter tank of gas in the car for emergency purposes. I usually fill up when my car’s gas gauge reaches the quarter tank level as it is. Occasionally, I do go past this, but most of the time, I do fill up at the quarter tank level. Again, you never know, no matter how remote the possibility, when you may have to evacuate your town or city in the middle of the night due to some disaster and your car is the only ticket out. So, don’t overlook these items when planning for emergencies. You have planned for emergencies, haven’t you? Here in the Portland area, antiques are a big business, and you can find lots of antique shops and you can also find antiques at flea markets as well. I like looking at antiques to see the things people used, as well as the precursors to many things we have and use today. One of the things I’m struck by as I get older is, when I’m in an antique shop, I see more and more things that were once “state of the art”. 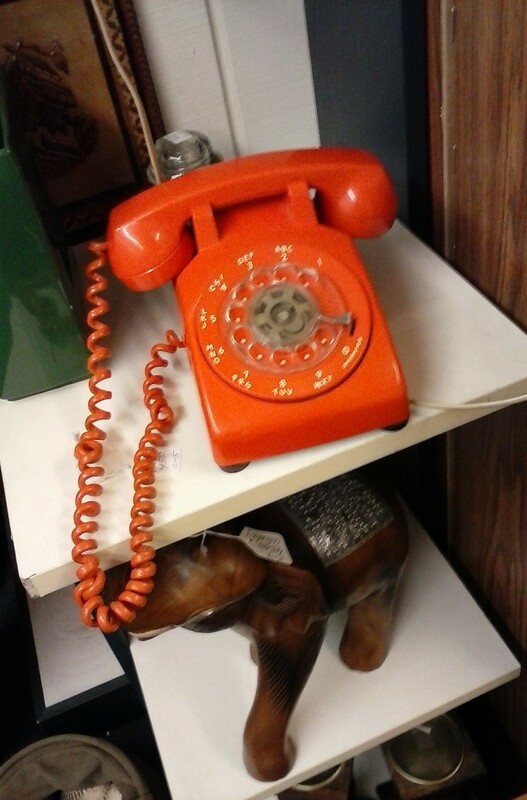 Last week, I was in an antique shop and saw this orange phone, pictured below, with a clear plastic dial. It was from about the early 1970’s. And I remember when these phones came out, as an upgrade from the phones which had a dial the same color as the phone and looked more antiquated when compared to the “clear plastic” dial phones. They, the clear plastic dial phones, were state of the art of that time and I remember thinking they were forward-looking. Ah, but how time has really marched on. Push button phones came soon after, followed by hand-held phones with a central base. Then the first useable cell phones, like the large black Motorola phones of the early and mid-1990’s, arrived. Then smaller cell phones came out, each new version able to do more and be less bulky, followed by the blackberry and smart phones after that we now have. And now, the smart watch has come out, though it may be too small to make a big splash just yet, however, with improvements, and technology that we haven’t thought of yet, it still can make a splash later on, even if it doesn’t now. And the thing is, one day, even these, along with smart flat screen TV’s, tablets, kindles, dual purpose laptops, and the top of the line home theater systems now available, will all find their way into antique shops, replaced with something we possibly can’t even imagine yet! Today’s “state of the art” is tomorrow’s antique. I am now a believer in buying used cars. (Yes, I know, the term now is “Pre-Owned”, but I’m still hard-wired to say “Used”!) I bought my first, and current, used car in December, 2012, a 2007 Toyota Corolla, and it’s still going strong. There are a number of things which I’ve learned that are better buying used, and I do mention cars being among them in my post, “Used vs New: Which is Best to Buy?” Now, here are the reasons why. First, used cars are cheaper! This is true for most things, as a matter of fact, but cars are special, in that they are often the most or second most expensive item that people buy, and new cars depreciate greatly from the moment you drive one off the showroom floor. In my case, for my previous car, which I bought new, I paid roughly $20k. I had the car for 7 years before it was totaled. That comes out to about $2,860 “paid” for each year I had the car. And mind you, I was able to pay the entire amount at that time, so I had no car payments to make and thus saved possibly $5k-10k in interest! I paid $10k out the door for my current used car, which would have also been $20k when new, and have now had it for about 3 years come this December. At that point, that would be roughly $3,333 for each year. By June, 2016, I will be breaking even in comparison to my previous car, in only 3 and half years! When I’ve owned my current car for 7 years, the same amount of time I had my previous car, it will come down to $1,430 “paid” per year! And another way in which I come out ahead: I paid $10k less for a good car, than what I paid 7 years earlier, despite inflation over that time! In a way, that’s $10k to the good for me! Next, related to the first, is that you have less of an investment to lose. I’m given to understand that new cars will have the most depreciation within the first two years. So, with a used car two years old or more, it’s possible you’ve got a car that has had most of its depreciation. So if you decide to sell it down the road (pun intended! ), you may recover a much larger proportion of the money you spent to buy the car and, in some cases, you may even come out ahead! Then, used cars tend to be cheaper to insure. When I got each of my new cars previously, my rates always went up. With my current car, they didn’t. Now, one thing is, you must do some research and also make sure you get any used car you’re thinking of buying, inspected by a trusted mechanic. If you do, you’re more likely to reap the benefits I’ve just described. Many say that buying a used car is buying someone else’s problem. But, think about this. If you’re paying $300 or more a month for that new car, month after month for 36-72 months, do you think that you’ll be paying that much every month in repairs for the used car you could buy instead at half the price? My bet is that you will not, especially if you do your due diligence when shopping for that cheaper used car. Just something to think about. Finally, while I don’t plan on any big modifications on my car, I feel that I can modify the car as I please without that feeling of “messing new things up”. So, these are my primary reasons for preferring used cars, and have made my motoring a lot happier! If you are in business, or even if you have the latitude as an employee, there are less obvious ways to increase the chances for more business and a better reputation. And one good one is? Give customers a break when the opportunity arises! No, this isn’t about offering discounts en masse. It’s about giving breaks in certain, usually individual, circumstances. For instance, I build resumes for people on the side. I charge $30 for a one to two page resume and usually charge $5 for making changes later on if there are more than one change or if the change is somewhat substantial. But, one time, a customer sent me his resume and wanted me to make changes as I saw fit. However, his resume was good as it was and I only needed to make a very minor date change that he’d told me about. So, since it only took two seconds, I let him know that there’d be no charge. He was pleasantly surprised by this and I’m guessing he probably told a person or two. Yes, I could have charged him at least my $5 minimum, but I chose not to. Why? Because it creates good “Karma”. Maybe it won’t lead to more business, but then again it might, even if it’s just from him. You see, at the very least, he knows I’m not this hard case who will charge just for contacting me. And if he needs a new resume, he may just remember me. When a business, especially a small business, does something like this, they do get remembered, even if it is after a while. And, when those customers who’ve gotten those breaks talk about it, even if it’s just a casual mention, it acts as free advertising. And, if you’re an employee whose been given the latitude to cut people breaks at times, do it! It can mean a good comment for you on that comment card or online survey, or even a letter of commendation sent to your boss or someone even higher up, leading to a raise, promotion, or both, for you down the line. 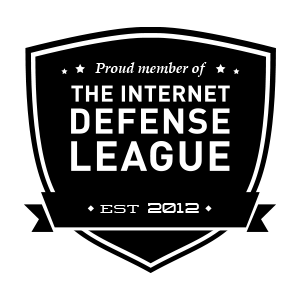 And, as an employer, it’s a good idea to give a trusted and proven employee just that kind of latitude. As the recipient of some of these breaks, I do make mention of the good deals and breaks I’ve gotten, as well as a list of people and places to go to where I know I’m going to be treated well, instead of as just another pigeon to pluck! And, I’m quite sure that I’ve gotten some business as a result of my cutting someone a break. And, speaking as a small entrepreneur, I know that any free advertising helps! So don’t forget to cut some breaks if you’re able to. It can really help the bottom line, in more ways than one!